10 minutes after it happened. What do you do first as a photo journalist if you see someone in grave danger? Take a picture or help. I know the answer 100 per cent, from personal experience, because that's the situation I was in on Sunday 4 April 2010. As a photojournalist I've been in many tight spots and when it's your own life on the line you just take risk as a given. In certain situations you expect danger. But when you're out for a walk on a beach in Belgium, taking pictures on a clear afternoon, you don't expect to be plunged into a life and death situation. Magda, my wife, and I were photographing near the harbour in Ostend. As photographers we often venture into areas not open to the general public to get more interesting images. So we went under the rope cordon and crossed into a construction area. 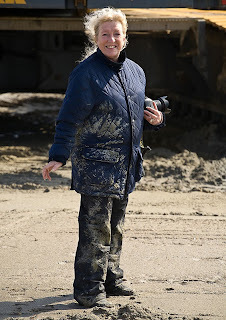 20 minutes later I heard a shout for help and to my horror 10 meters away I saw Magda sinking into quicksand. I rushed over and managed to stay just on the edge of the patch. When I saw my boot starting sink as well I knew I had to act really quickly. Magda was already waist deep. A few more minutes and it would have been over. A grim death. I grabbed her wrist and yanked her out. I knew speed was of the essence as the further she sank the harder it would be to get her out. We both remained calm. Magda did shout, "My camera, my camera!" Afterwards we thought that was really funny. "You should have taken a picture of me in the quicksand. Some photojournalist you are! Although at the time I would probably not have been amused," said Magda later. So there you have it. I'm a trained and experienced photojournalist but when it came to seeing Magda in grave danger, I didn't get the shot. If you would like to read Magda's version of the story then check out her blog. She also has photos of where it happened. I know many of you go out photographing by yourselves. Do please be careful. Please feel free to follow me through the Google widget on the right. Obviously i can remmember due to this article, the story of Kevin Carter and the story of his photo, the vulture waiting for the death of a starving girl. The history says that Carter left the girl alone, after taking the photo, and it´s like in your article, but in the other side, you saved you´re wife, but Carter left the girl.